Waffling: Decorating the New Patio! I picked up quite a few cute things! Some are staying, some are not. 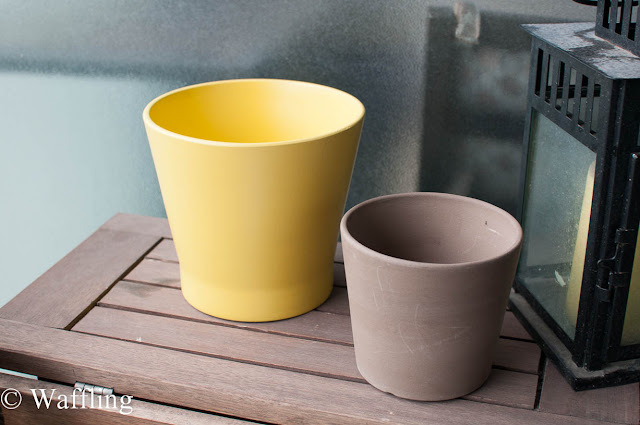 For keeps, I got these two new pots for plants outside. I plan to zazz up the whole balcony with plants! Ikea has lots of cute potted plants and I plan to get some flowers from the cheap-o flower shop near my work. However, I didn't have the extra hands on Friday to pick up any plants. I also got a new pillow for one of my new chairs! You might be looking for the pillow on Ikea website, but you will never find it because I made it from this Ikea dishtowel! I also used a $4 pillow insert from Ikea so this pillow only cost me $10! To make the cover, I cut the patterned material in half and bound the raw edge. 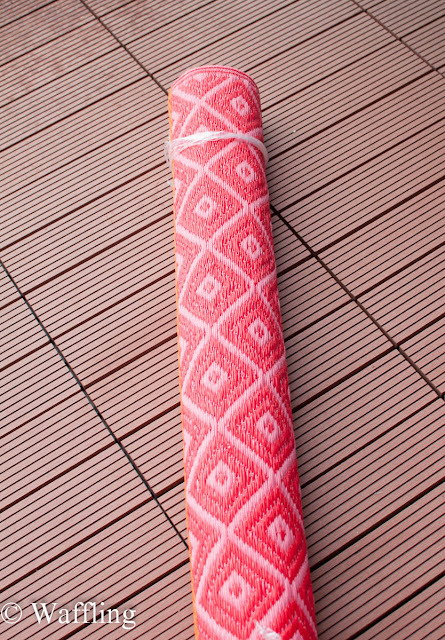 Then I sewed each piece of the patterned fabric to the top and bottom of the flamingo piece. I then sewed the sides shut (this way the two pieces in the back are open in the middle, but overlapping to hide this. Lastly, I am returning some things! I had picked up two of these railing plant holders in white. However, the railing part is too narrow for my apparently fat railings so they are going back! My Dad thought that maybe I could bend it to make it fit, but I really don't trust the thin metal not to break and then I am out $17. So I shall return these and find other ways to bring more plants outside. 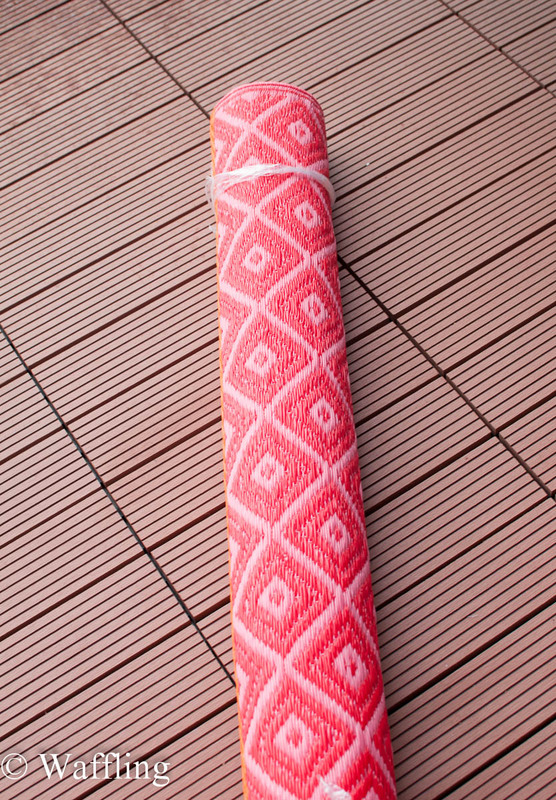 I also had picked up this outdoor runner. It was completely the wrong size, since it only came in a runner, but I figured it was only $15 so I could attempt to resize it. I LOVED the way it looked on another blog, Hi Sugarplum, and I loved it in person too! Holy Guacamole, I just noticed she has flamingo pillows too?? I didn't even notice that! 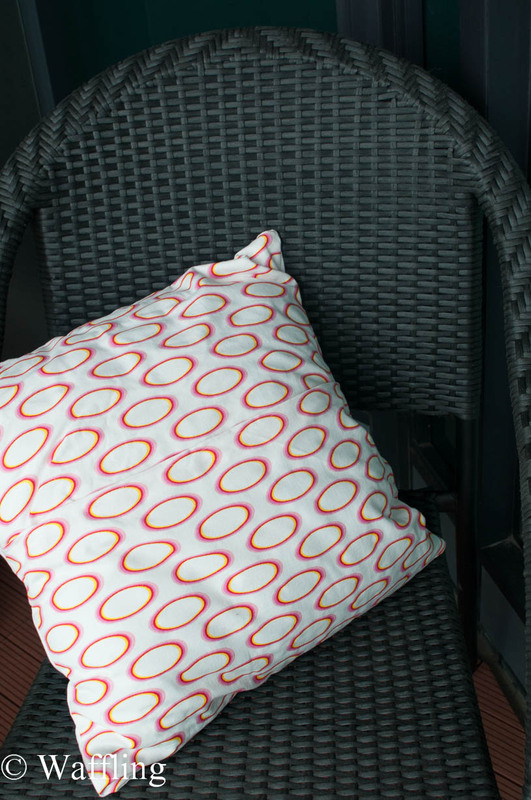 I just fell in love with the flamingo glasses at Ikea, but I don't need glasses so I decided to make a pillow! 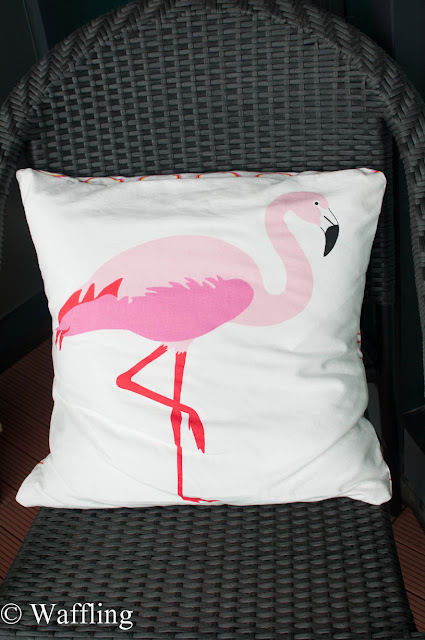 I don't think Ikea Canada sells a pre-made flamingo pillow, because I never saw one there. Anyway, on my balcony, this rug was a no-go. The floor is a bit of a muted red/brown and the bright red and pink of the rug was WAY too clashy! So I am going to return it. Plus I love the new floor so much that I am not sure I want a rug at all now. If you don’t already have a patio, delegate a space that will be designated “the patio.” Separate it from the rest of the backyard somehow. One way is with stone slabs, pavers or a wood deck. You should surround the patio with short bushes or plants or simply let the edge of the flooring meet the grass. Placing potted greenery and/or flowers will decorate the patio space nicely. The pots should be of varying sizes and heights for visual interest.